This church was originally built in the Gothic style, although certain finishing touches tend to be Renaissance-like. After a fire in XVIII century, it was rebuilt in the Baroque style, although later in the same century, an attempt was made to restore its original aspect. 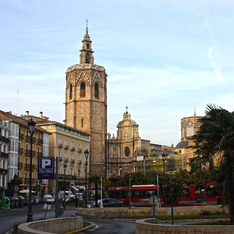 The bell-tower is one of Valencia's finest examples of Baroque, and houses bells cast in London.